In most cases, the new lung or lungs are donated by a person who is under age 65 and brain-dead, but is still on life-support. The donor lungs must be disease-free and matched as closely as possible to your tissue type. This reduces the chance that the body will reject the transplant. Lungs can also be given by living donors. Two or more people are needed. Each person donates a segment (lobe) of their lung. This forms an entire lung for the person who is receiving it. During lung transplant surgery, you are asleep and pain-free (under general anesthesia). A surgical cut is made in the chest. 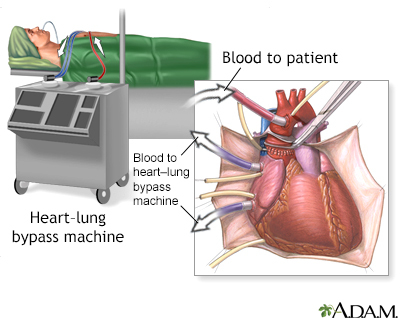 Lung transplant surgery is often done with the use of a heart-lung machine. This device does the work of your heart and lungs while your heart and lungs are stopped for the surgery. 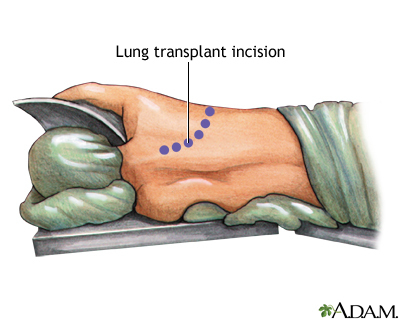 For single lung transplants, the cut is made on the side of your chest where the lung will be transplanted. The operation takes 4 to 8 hours. 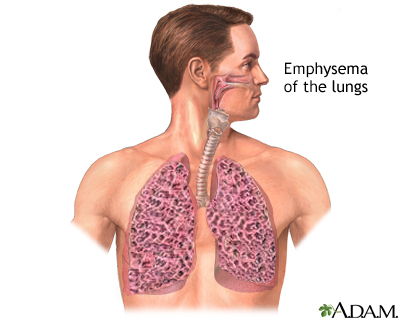 In most cases, the lung with the worst function is removed. For double lung transplants, the cut is made below the breast and reaches to both sides of the chest. Surgery takes 6 to 12 hours. You are placed on the heart-lung machine. One or both of your lungs are removed. For people who are having a double lung transplant, most or all of the steps from the first side are completed before the second side is done. The main blood vessels and airway of the new lung are sewn to your blood vessels and airway. The donor lobe or lung is stitched (sutured) into place. 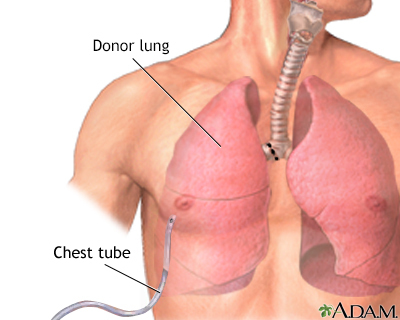 Chest tubes are inserted to drain air, fluid, and blood out of the chest for several days to allow the lungs to fully re-expand. You are taken off the heart-lung machine once the lungs are sewn in and working. Sometimes, heart and lung transplants are done at the same time (heart-lung transplant) if the heart is also diseased. Blood clots (deep venous thrombosis). Diabetes, bone thinning, or high cholesterol levels from the medicines given after a transplant. Increased risk for infections due to anti-rejection (immunosuppression) medicines. Damage to your kidneys, liver, or other organs from anti-rejection medicines. Future risk of certain cancers. Problems at the place where the new blood vessels and airways were attached. Rejection of the new lung, which may happen right away, within the first 4 to 6 weeks, or over time. The new lung may not work at all. For most adults, the amount of time you spend on a waiting list usually does not determine how soon you get a lung. Waiting time is often at least 2 to 3 years. Follow any diet your lung transplant team recommends. Stop drinking alcohol, do not smoke, and keep your weight in the recommended range. Take all medicines as they were prescribed. Report changes in your medicines and medical problems that are new or get worse to the transplant team. Follow any exercise program that you were taught during pulmonary rehabilitation. Keep any appointments that you have made with your regular health care provider and transplant team. Let the transplant team know how to contact you right away if a lung becomes available. Make sure that you can be contacted quickly and easily. Be prepared in advance to go to the hospital. Do not eat or drink anything when you are told to come to the hospital for your lung transplant. Take only the drugs that you have been told to take with a small sip of water. You should expect to stay in the hospital for 7 to 21 days after a lung transplant. You will likely spend time in the intensive care unit (ICU) right after surgery. Most centers that perform lung transplants have standard ways of treating and managing lung transplant patients. 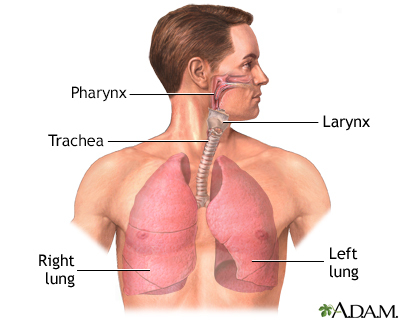 A lung transplant is a major procedure that is performed for people with life-threatening lung disease or damage. About four out of five patients are still alive 1 year after the transplant. About two out of five transplant recipients are alive at 5 years. The highest risk of death is during the first year, mainly from problems such as rejection. Fighting rejection is an ongoing process. The body's immune system considers the transplanted organ as an invader and may attack it. To prevent rejection, organ transplant patients must take anti-rejection (immunosuppression) drugs. These drugs suppress the body's immune response and reduce the chance of rejection. As a result, however, these drugs also reduce the body's natural ability to fight off infections. By 5 years after a lung transplant, at least one in five people develop cancers or have problems with the heart. For most people, the quality of life is improved after a lung transplant. They have better exercise endurance and are able to do more on a daily basis.